Shop at Essential Apparel, online at EssentialApparel.com, for all the essentials for women, men, boys, and girls. Essential Apparel is the online shop for finding high quality undergarments, including hosiery, tights, underwear, bras, boxer briefs, t-shirts, long underwear, sweat pants, and more. Essential Apparel also offers outwear, including jackets, winter coats, vests, and apparel like dresses, pants, tanks, and more. Essential Apparel carries top brands, such as Columbia, Rothco, Carhartt, Levi's, Lee, Wacoal, and Calvin Klein. But before you shop, be sure to get all the latest EssentialApparel.com discounts, Essential Apparel promotions, and Essential Apparel coupon codes found here at RetailSteal.com. Essential Apparel ships within the United States, APO/FPO addresses, U.S. territories, and Canada. See site for more information. Shop online at Essential Apparel and use this coupon code for 10% off your purchase. Code applies on orders of $100+. Essential Apparel offers up to 70% or more on a wide selection of apparel - from outerwear to underwear. Click here to save on The North Face, Flexees, Carhartt, and more. Enjoy 10% savings on your entire order from Essential Apparel when you use this coupon code online. Click to save. Use this coupon code online at Essential Apparel and save 5% on your purchase over $49. Click here to shop. Shop at Essential Apparel and save $10 on your purchase over $100. Click here and use coupon code. Essential Apparel orders within the Continental U.S. are shipped for free with a minimum purchase of $49. Click link to shop. 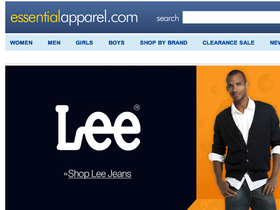 Shop at Essential Apparel for Levi's jeans and pants and save up to 48% or more. Click link to shop. Shop at Essential Apparel and save up to 30% or more on a wide variety of bras. Click here to shop and save on Bali, Warner's, Playtex, and many more.